Are your students ready for Professor Ehrman? The current statistics among many of my colleagues is that "80% of students raised in Christian homes, who go off to secular Universities, reject their faith by the first year." I'm not a conspiracy guy. I don't believe in a message of fear. I'm not into conjuring up stuff so you'll read this blog. I'm just a camp director who happens to love telling people about how to make sure they understand what Faith is. I'm a follower of Jesus, who wants to make sure I know the truth. Professor Ehrman is a best selling author, and professor of religious studies at the University of North Carolina at Chapel Hill. And, truth be told, there are thousands of professors out there just like him. 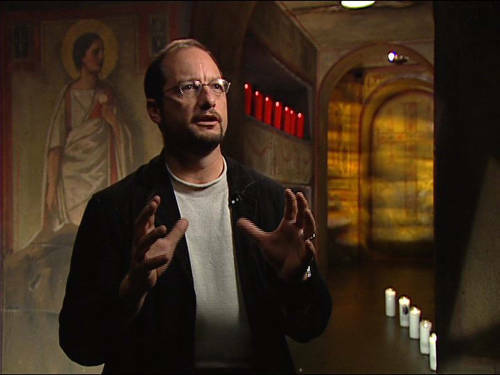 Dr. Ehrman is a staple for the Discovery Channel, and the History Channel, and evidently is providing some convincing arguments in the areas of Biblical Infallibility, the Resurrection Hoax, and he even questions the very divinity of Jesus. Dr. Ehrman is the reason why I do what I do. Well, not Dr. Ehrman specifically, but the thousands of professors out there that are well versed in the history and culture of the Bible, and their attempts to make sure students have "the whole truth" while destroying everything they believe. I met a professor like Dr. Ehrman when I went off to college. I came from a Christian home, was a leader in the youth group, and thought I new my faith solid. When I went off to the University, my philosophy professor made similar claims that Dr. Ehrman is making, and it through me for a loop. I traveled through college in defiance of the Christian faith, and wanted nothing more than to prove how fake it was. But through the long journey for truth, I found that Jesus is truly the way to understanding the cosmos around us, the nature of relationships we have on this planet, and the reason I am here on earth. The professorial claims didn't stick too much when I started asking real life questions about other religious alternatives, and truth be told; it is the sole reason I've stayed here in the mix with teenagers from around the globe. They need someone in their corner. They need to know the Bible is true. They need to realize that Jesus is worth following. But with guys like this, it's very hard to keep following something if you don't know anything about it. Guys like Dr. Ehrman have an agenda to make sure the Bible doesn't line up. They're attempt at pseudo-intellectualism only fuels my fire to read and discover the points they make, and to help students survive. The whole premise of Kanakuk Colorado is to help students reconcile their faith, understand what they believe, and see how crucial it is to begin thinking about tough real life issues. I don't think you HAVE to come here to find faith, for that would lead someone to believe this is the only place to find faith. I don't think we need to discard Dr. Ehrman in our circles of faith. In fact, I think we all need to take the arguments Dr. Ehrman is asking and try to understand the whole of the issues. We must be a people who ask questions, so we can find truth. We must allow for a confidence that if our faith is real, there are no stones that need go unturned. But we must not be a people who just bow to the throne of the Academy, and accept all truth as equal. Jesus is a real historical figure. The Bible is a divine document. The Holy Spirit is ALIVE and well in the world today. Why do I care to share this with you? Because I was one of those students that needed a little more information before I went to school. I needed to explore and understand the principles of the Christian faith. I was a student unprepared for the Dr. Ehrmans of the world. Let's stop being a people swayed by any smooth sounding argument, and start understanding the reason for the hope we have. Next From Before the Beginning of the Universe…Adoption. Andy-that is such good stuff! Piper has a sermon addressing Ehrman is such a similar manner. I am so thankful for the Truth you provide kids at Kamp every summer. The only Truth that can set them free. I hope your summer is extremely blessed. Thanks for the continual sharpening and encouragement!